Rocky Top Sports World is excited to host a special opportunity for young athletes in the Gatlinburg, Tennessee area! Former NFL and University of Tennessee football player Jabari Davis will host a two day camp at our athletic complex on March 28 – 29, 2016 from 9 a.m – noon. Read on to find out all the details about this exciting event. In a 2003 game against Florida, Davis helped lead the Vols to victory with a 78-yard, two touchdown performance. Davis had two career 100-yard rushing games, with a career-high 135 during a 2002 game against Arkansas. In the 2002 season, Davis was the University of Tennessee’s second leading rusher with 559 yards. In the 2003 season, Davis scored eight regular season rushing touchdowns, leading the team and ranking fourth in the SEC. Today, Jabari Davis is the CEO of his own training camp company, a football coach, and a college recruiting scout in East Tennessee and North Georgia. He is a proud Vol for Life and attends as many Tennessee football games as he can. Jabari Davis’s camp at Rocky Top Sports World will focus primarily on how to improve speed, agility, and quickness – abilities that virtually every sport requires. We can’t think of anyone better qualified to teach these skills! The camp is open to both boys and girls, ages 7 – 14. In addition to improving physical ability, the camp will also focus on academics and character building skills. Davis understands the importance of being a well rounded individual and leaves every group he talks to feeling inspired and ready to tackle all of the challenges in their lives, whether on or off the field. To register for this event, give Rocky Top Sports World a call at 865 – 325-0044. Space is limited at this Gatlinburg camp, so be sure to reserve your spot as early as possible! Sessions will be $39 per day or $70 for two days. 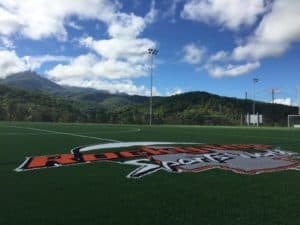 Rocky Top Sports World is the ultimate destination for tournaments, camps, and other sporting events in the Southeast! Our multimillion-dollar athletic complex features seven outdoor fields, six basketball courts, twelve volleyball courts, team rooms, an onsite grill, and everything else you need to play, train, and have fun. Located in the beautiful city of Gatlinburg, Tennessee, our campus is surrounded by breathtaking mountain scenery and is just minutes away from all of the shops and attractions in the downtown area. Visit the Rocky Top Sports World Tournaments and Camps page to see all of the upcoming events scheduled for this year. This entry was posted in Gatlinburg Sports Events on February 1, 2016 by Jason Fishman.